Cabbage is a vegetable grown on either a small scale or a large scale in Uganda and it is grown for mostly the growing market for the vegetable and for home consumption. The early cabbages normally take 65 days to mature although some take 63 days and these include the Red express Acer cabbage. The midseason cabbages take almost 71 days to mature for harvesting and an example includes the Baby cabbage. The late season cabbages take 75 days to grow and be ready for harvesting. Before you start planting, you should first test the soil for fertility. A PH of 6 to 7 is what the cabbages need to grow well and you can add lime just in case the Phis lower and the amount of lime added will determined by the fertility rate of the soil. The soil testing can be done regularly and the lime should be applied six months before the planting takes place. And you should also note that cabbages are planted in soil that has some clay in it. The germination process takes four to ten days and takes 80 days to grow and harvest although if they were planted in a seed bed, they should be transferred to the main garden at seven weeks. Cabbages do not grow well in hot weather, so if you are expecting a good germination you need to plant them in seasons that are not too hot. It should also be noted that cabbages need a lot of feeds and should be given as many nutrients as needed to grow the healthy heads. And they grow best in soil rich in organic matter and the soil needs to have a high level of water retention. Plant and root growth can be increased by heaping soil around the stem and root area before the formation of the head. For the cabbages to germinate well, they need to be planted in more aerated soil and in order to keep the soil moist you need to have a thick layer of 15cm to 20cm deep. The cabbages should have a spacing of 50cm by 50cm for the smaller cabbages and 70cm by 70cm for the larger ones. You can also plant per square foot for each cabbage. When applying the nutrients you need to make a schedule divided into two that is before planting and every after six weeks. You can add the fertilizer at the beginning of transplanting and add extra boost when the cabbage starts the head formation. Cabbages are grown under irrigation to make sure here is a steady supply of water because it grows better in water logged area and the heads of the cabbages tend to crack if the soil becomes dry. Below is a table showing the amount in kilograms needed when adding nutrients in the school. The nutrients need to be added to their right quantities because if they are added wrongly, it can cause imbalances in the nutrients in the soil and that’s why you need to test the soil to know the amount of fertilizers that you need to be added. Remember to weed the garden often since the cabbage is a shallow crop and this also limits the fight for nutrients in the soil. I have drawn a table below to show farmers how they can tell which nutrient is lacking in the cabbages. Leaf bright, this makes the leaves turn yellow and also causes stunted growth of the cabbage head. Black leg, this is a fungal disease which forms dark veins on the stem and leaves of the cabbage. Club root is a disease which prevents the cabbage from absorbing the nutrients and water preventing proper growth. Cabbages are prone to be attacked by aphids and caterpillars and to avoid this you need to check the cabbages regularly for caterpillars and use wood ash on the cabbages to chase pests because these eat the massive leaves. To avoid aphid on cabbages, you need to increase the water supply and reduce on the heat that the cabbages get. It should also be noted that caterpillar infestation can be controlled if you plant them in a cold season. 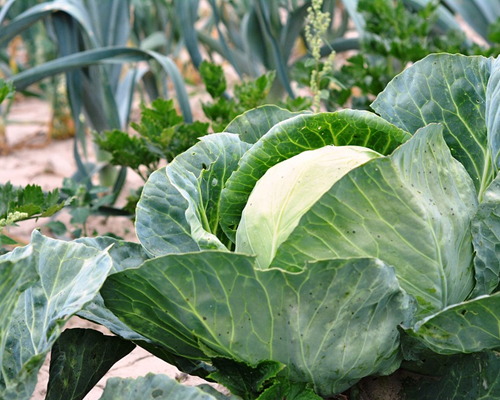 If you want to reduce on soil diseases that attack cabbages, you need to plant different crops after harvesting like beans, maize and avoid the cabbage family plants altogether. If you want to reduce on the spread of the diseases in a cabbage, then you need to remove and burn the infected ones from the good ones. Plant the seeds in a seed bed in rows spaced 15cm apart and 1 to 2 cm deep in the soil. Keep on watering the seeds in order to keep the soil moist and the seeds will germinate after planting between 4 to 7 days. The seeds should be hardened to prepare them for transferring to the main garden and they should also be thinned to 7.5cm after the germination process. You should water the main garden before transplanting the seedlings and they should be watered throughout until they are firm in the ground and you should note that the transplanting should be done when the seedlings are 6 to 8cm high. Lastly the cabbages need to be mulched to keep the soils moist and you should harvest them when the right time comes. The best way to harvest cabbages is by cutting the stem with a sharp knife above just above the ground. The cabbage head should be cut before it cracks open due to the heavy rains and the head should be mature and solid before cutting them. Once the harvest is complete, uproot both the stem and root from the ground and if the plant is still healthy then compost the remainders. The Napa cabbage, also known as the Chinese cabbage has a mild flavor and has a high maturity rate. Savoy cabbage, this has crinkled dark green outer leaves. The pointed cabbage and this has a pointed head which acts as protection against insects. Red cabbage, this is purple due to the fact that it contains antioxidant anthocyanin. Mini cabbages which are good for a small garden since they can be harvested when they have a 6 inch diameter. Green cabbage has a very good flavor and the maturity growth rate differs. It comes in different sizes. The cabbages are frequently attacked by diseases and pests which lead to losses for the farmer. There is also a problem of soil fertility, if the soil fertility is extremely low the cabbages will not grow well hence leading to poor produce. The cabbages are also affected by moisture which is hard to control by the farmer since its natural weather. It causes the cabbages to wither and rot. They provide vitamin C which is good for people’s health. It’s a source of income for the farmers which improve their livelihood. Cabbages help in reducing chronic inflammation that might cause heart diseases. They have antioxidants that reduce inflammation. They also help in the digestion process that is it has insoluble fiber which helps easy bowel movement and keeps the digestive system healthy. Finally after knowing all about planting cabbages, you need to also note that cabbages have a stunted growth if planted next to eggplants, maize, strawberries and garlic because they absorb the nutrients from the soil causing the cabbages to have less nutrients for their healthy growth. Cabbages have a high growing market in Uganda because the number of vegetarians in the country is on the rise and it’s a lucrative agricultural venture if you are looking into earning extra income.